During his visit to the Golden Temple today, Britain's Prime Minister David Cameron assured SGPC president Avtar Singh Makkar that he would take up the issue of turban ban in France schools with the French Government. Disappointed at the British Prime Minister not tendering an apology during his visit to Jallianwala Bagh, kin of the Jallianwala Bagh martyrs termed the visit as “meaningless”. They condemned the local administration for not letting them meet the British Premier. The Moga byelection will be remembered for the start of a new political experiment in Punjab. The election was thrust upon the people by the SAD by inducting Congress legislator Joginder Pal Jain into the party. Except one, all the 54 complaints filed during the ongoing campaigning for the Moga byelection were either found fake or frivolous, demanding no action on part of the Election Commission. With a day left for campaigning for the Moga assembly byelection, leaders of the main political parties are gearing up for their final endeavour to woo the 1.80 lakh voters. However, none of the leaders has so far raised issues concerning the people. An employee of the Punjab Roadways was injured and the turban of another was removed in a clash between two groups at the local depot here. Maninderpal Singh, depot general manager, in a complaint to the police has sought an FIR against the striking employees who allegedly assaulted those on duty. Not a single leader of any political party visiting Janer village on the outskirts of Moga for campaigning has ever visited the de-addiction centre of the District Red Cross. The centre has been neglected for long despite the fact that drug abuse is alarming in Moga. The two-day international conference on “Human Development and Knowledge Economy” held at Punjabi University, Patiala, concluded here today. Professor Radhe Shyam Pradhan, Tribhuvan University, Kathmandu, Nepal, presented the valedictory address and said that South Asian countries must coordinate with each other to improve the standards of education. The North-West Frontier of the Indo-Tibetan Border Police Force (ITBP) celebrated its seventh raising day here today. As many as 16 ITBP officers and men, who were conferred with the Director General’s Disc for their outstanding performance, were honoured. Deputy Chief Minister Sukhbir Badal faced an embarrassing situation while addressing members of the District Bar Association today. As soon as he finished his speech, association member Narinder Chahal stood up and told Sukhbir that he committed one of the biggest mistakes in his life and in the history of the SAD by promoting the culture of defection by inducting Joginder Pal Jain into the party. In a reminder to advocates of their responsibility towards the Bench, the Punjab and Haryana High Court has asserted that the Bar owes a duty to the Court to carefully screen matters in chambers before filing misconceived, misdirected and petitions that are devoid of merit. Punjab police personnel posted along the Punjab-Haryana border have been put on “high alert” to prevent any untoward incident in the build-up to Dera Sacha Sauda chief Gurmeet Ram Rahim’s personal appearance before a Bathinda court on February 22. A city-based money changer, Hari Om Garg, who had been missing since Monday, was found murdered in Haripur village near Nakodar this afternoon. The police said it had tracked the calls on the victim's cell phone and arrested three persons, including a dismissed Punjab Police employee, and recovered a pistol, ammunition and Rs 6.50 lakh from them. The suspects were known to Garg. The Panjab University (PU) will send the evidence, submitted by five women teachers alleging sexual harassment by the centre superintendent on examination duty, to the Central Forensic Science Laboratory (CFSL), Sector 36, for authentication. District court lawyers suspended work here today in protest against the failure of the police to track down a lawyer who has been missing since February 17. The victim identified as Satwinder Singh (27), resident of Badi Haveli, went missing on February 17 while his car was found parked near Bhakra canal at Pathreri Jattan village in Ropar. Makkar had written to the Prime Minister, saying that Britain, being a member of the European Union (EU), could prevail upon France to allow schoolchildren of Sikh faith to wear the turban. He told the British Premier today that France, despite being a founding member of the UN, was not ready to follow the decision of its committee, asking it to abide by the decision of the EU in the matter. To a question, Makkar said the issue of Britain returning the Kohinoor to the Sikh Panth was not raised with Cameron. The British Prime Minister, accompanied by Chief Minister Parkash Singh Badal, his head covered, went around the Parkarma and bowed before Guru Granth Sahib at the sanctum sanctorum. He then went to Sri Guru Ram Das Langar Hall but did not eat langar. At the sanctum sanctorum, Head Granthi Giani Mal Singh handed over a siropa (robe of honour) to the visiting dignitary who patiently listened to the rendering of Gurbani. Later, he visited Akal Takht. Badal gifted the British Premier an encyclopaedia on Sikhism and a shawl. The SGPC chief presented him a set of books, including “Sikhs in Great Britain,” and a picture book, “The Golden Temple of Amritsar Reflections of the Past”, and a model of the Golden Temple. A spat erupted between photojournalists and policemen when one of the lensmen fell unconscious. The policemen on duty refused to open the enclosure gates to enable his colleagues to fetch water. The matter was resolved on the intervention of the Chief Minister, who said action would be taken against the erring policemen. Arvinder Singh claimed that India had emerged the largest exporter of rice this fiscal year, replacing Thailand from the top slot. India had already exported 8.3 million tonnes of rice till January 2013 against the last year's figure of 7.7 million tonnes. He said that the price of basmati had increased from Rs 2,200 per quintal last year to Rs 3,700 per quintal now. The British Premier was gifted a phulkari shawl and a picture of the Golden Temple. He was accompanied by Kuldeep Singh Wohra, Director, East End Foods, England, British High Commissioner James Bevan and other members of the delegation. He was at the factory for more than 30 minutes. Disappointed at the British Prime Minister not tendering an apology during his visit to Jallianwala Bagh, kin of the Jallianwala Bagh martyrs termed the visit as “meaningless”. They condemned the local administration for not letting them meet the British Premier. Some of them claimed to have been kept under a vigil since last evening. Bhushan Behl (52), whose grandfather Lala Hari Ram Behl was killed at the entrance of the Jallianwala Bagh, said he and a few others were detained at their homes till 1 pm. Sunil Kapoor (37), whose great grandfather Vasu Mal Kapoor died of bullet injuries three days after the Jallianwala Bagh firing, called it " more of a politically motivated visit." He said he had submitted a list of martyrs, procured through the RTI, to the British High Commission but was not allowed to meet dignitary. However, SK Mukherjee, whose great grandfather SC Mukherjee was among the Jallianwala Bagh victims, seemed satisfied with the British Premier's views expressed in the visitor's book. Mukherjee, secretary of the Jallianwala Bagh National Memorial Trust, was with the visiting dignitary during his brief visit to the Jallianwala Bagh. If the purpose was to further demoralise the Congress, it has not worked. In fact, the election has helped the state Congress galvanise itself and even boosted the image of its president Capt Amarinder Singh who has transformed himself into a hard worker and washed off accusations of being an easygoing campaigner. On the other hand, for SAD president Sukhbir Badal, who is known to be an aggressive campaigner adept at micro management, the election is an opportunity to prove that he can single-handedly dictate the politics of the state. Sukhbir hopes a victory here will build the tempo for the forthcoming parliamentary elections. But political gambits are a risky affair. Capt Amarinder has now chosen to take the challenge head-on. The Congress had won this seat by 4,500 votes only a year ago and it feels this is the right opportunity to stop the Akali juggernaut. Party election incharge Rana Gurjit Singh said: "We will win because for the first time Capt Amarinder is working hard. I don't want to say this but this is the truth". Rana Gurmeet Sodhi said the byelection would be remembered for the manner in which Amarinder put his best foot forward to win back the voters' confidence. Seeing the people's reaction to the party's campaign, general secretary incharge of Punjab Gulchain Singh Charakh admitted Amarinder remains the best bet to lead the Congress in the state. Talwandi Sabo legislator Jeet Mohinder Sidhu, who drives Amarinder during the campaigning, echoed similar sentiments. He said after moving to the constituency on February 2, the PCC chief went out only for a day on February 9 to attend the wedding function of Amritsar leader Sukhjinder Randhawa's daughter at Chandigarh. "Capt has been camping here since then. He even missed the wedding of his niece in Delhi," he said. Amarinder's electioneering starts at 10.30 am with a break for lunch at a supporter's house. Sidhu said Amarinder managed five rural and two urban meetings in a day which ended at around 8 pm. "After that we sit down and strategise", he added. On asking when he last worked so hard, Capt Amarinder said: "My job is to move around. I did so during the last assembly elections also. But the Akalis bought off our rebel leaders". Amarinder feels his party is well beyond the winning stage. "As of today we have won," he claimed. In case of Sukhbir, the Moga election seems to be an experiment on how Congress strongholds can be broken. There is a feeling in the Sukhbir camp that Congress men who cannot be beaten should be co-opted into the SAD. The Moga byelection will decide whether this experiment can be replicated elsewhere or not. Sukhbir is putting in even more time than Amarinder. The SAD president starts his day at 8 with a strategy session at the residence of senior Akali leader Tota Singh. At 11, Sukhbir is out in the field devoting most of the day in rural areas before converging into the city in the evening. After finishing electioneering at 10 pm, he takes feedback from party leaders coordinating different zones. "This meeting ends only by 2 am", an aide disclosed. The SAD chief claimed Amarinder's schedule was no match for his. "I do 20 programmes in a day. He does four," he said. He also claimed the Congress was still a divided house. 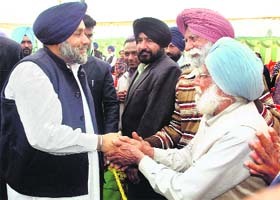 Sukhbir said the main agenda of the SAD remained development. 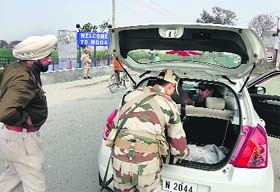 Security personnel check a vehicle in Moga on Wednesday. Moga: With just two days left for the Moga byelection, Central security forces have sealed all the nine entry points to the town and are thoroughly scanning the vehicles. Reports said vehicles were being checked at Singhawala, the entry point to Moga from Bathinda and Faridkot districts. Senior Superintendent of Police (SSP) Ashish Choudhary said the security forces were carrying flag march to ward off any untoward incident. Seven companies of Central Reserve Police Force (CRPF) have been deployed in the town to maintain law and order situation. They will also be deployed at the 94 polling stations and 188 polling booths. Jalandhar: Union Minister of Railways Pawan Kumar Bansal has stated the people of Moga will give their mandate against the ruling Akali Dal. Bansal campaigned for Congress candidate Vijay Sathi in Moga on Wednesday. He claimed the people of Moga had never voted for Jain. They had voted for the Congress and they would again vote for the party. He alleged the Akalis had never taken any decision in the interest of the state or the people. He said Sathi was a man of high integrity and the voters would elect him due to his merits. Jalandhar: The All India Bairagi (Vaishnav) Mahan Mandal has decided to support the Congress in the Moga byelection. The decision was taken at its meeting held under the leadership of its national president Krishan Kumar Bawa, general secretary Jiwan Dass Bawa and secretary Buta Singh Bairagi. The leaders claimed the Bairagi community had 7 lakh voters across Punjab and around 4,000 in the Moga assembly constituency. The complaints largely pertained to petty issues like installing transformers and electricity meters, releasing sewerage connections and transferring teachers to woo voters. All these complaints were found "baseless". The only genuine complaint was against the posting of a Superintendent of Police (SP) allegedly close to the ruling SAD-BJP alliance. Kusumjit Sidhu, Chief Electoral Officer, said: "After a follow-up of every complaint, we found that a majority of these were by fake signatories. The complaints had no material to substantiate the allegations". The Election Commission had earlier ordered the transfer of Moga SP (Headquarters) Dilbagh Singh Pannu following a complaint by Congress candidate Vijay Sathi that the SP had a close association with certain quarters in the ruling alliance. Police sources said as many as five murders were reported in the constituency during the campaigning till date. But not a single case was related to the election-related activity. The Chief Electoral Officer has asked the Moga Deputy Commissioner to respond to the complaint filed by the Congress Working Committee member Jagmeet Brar that the government disbursed Rs 45 crore grant after the code of conduct came into force. Brar has also alleged the district administration is not checking private vehicles being used by Chief Minister, his deputy and various ministers. Chief Minister Parkash Singh Badal and Deputy Chief Minister Sukhbir Singh Badal have been harping on development done by their government. But their candidate Joginder Pal Jain contradicted the development plank by saying he defected from the Congress since there was no development of this area and for that he wanted to join the ruling party. Akalis claim Jain sacrificed his position for the development of this area. But senior SAD leader Jathedar Tota Singh claims that he and his son Makhan Brar have contributed a lot in Moga's development by constructing a district administrative complex, a bus stand, an indoor stadium, a regional centre of the education board, besides improved civic amenities in the city. Having realised the ground realities, the Chief Minister of late started talking about Hindu-Sikh unity, communal harmony and peace in the backdrop of the SAD-BJP alliance to woo the 65,000 Hindu voters. The SAD knows that the key to victory is in the hands of 1.10 lakh urban voters. Akalis have never got a lead from Moga city, a fact that haunts the SAD leadership. On the other hand, the Congress and the PPP have been talking about the poor fiscal health of the state and the "deteriorating" law and order situation. The Congress leadership also accuses the SAD-BJP government of not utilising the funds sanctioned by the Centre for welfare schemes. Comedian-turned-politician Bhagwant Mann of the PPP said it was unfortunate that both the Congress and the SAD were not talking of core issues like unemployment, price rise and drug addiction. Shocked over the "insensitive" attitude of political parties towards the local issues, president of the local Citizens Welfare Council said there was no sewerage treatment plant, solid waste management plant and garbage dumping sites in Moga, which also lacked adequate supply of potable water. He said: "The proposed construction of flyovers on the GT road in Moga city is also a big issue. It will adversely affect the businesses of at least 1,000 traders, but unfortunately no party leader has taken up this issue". Ludhiana: Workers of the Punjab Roadways and the Pepsu Road Transport Corporation (PRTC) today responded to the strike call given by 11 central trade unions here. Passengers and commuters faced inconvenience for more than five hours as both the sides of the Ludhiana bus stand were blocked by the protesting workers. The patients visiting the ESI Hospital had to face a tough time due to traffic congestion. PRTC Managing Director DPS Kharbanda said the corporation bore a loss of Rs 80 lakh on the first day of the strike. Employees of public sector banks also observed the strike by remaining absent from work. Bathinda: Buses of PRTC and the Punjab Roadways remained off the road while no transactions took place at the nationalised banks. Postal services in the district were badly hit as employees of the All India Postal Employees Union and the National Union of Postal Employees joined the strike. At Bathinda bus stand, PRTC employees closed both the entry and exit gates and raised slogans against the government. Members of the Technical Services Union also joined the stir along with employees of BSNL and the Forest Department. Ropar: Majority of employees of the Roadways, power board, Bhakhra Beas Management Board, nationalised banks, BSNL, LIC, postal services abstained from work. The striking employees sat on a dharna in front of the Deputy Commissioner’s office and proceeded towards the old bus stand leading to traffic snarls on the Ropar-Jalandhar road for nearly one hour. Patiala: The striking employees stopped all buses as a result of which the commuters were stranded at the bus stand for hours together. Private taxi operators made the most of the opportunity. Commuters thronged the Patiala railway station to reach their destinations. Sangrur: Hundreds of people today blocked both gates of the main bus stand in Sangrur and refused to allow buses to enter. Private buses, however, plied from the Mahavir Chowk. A rally was held at the main gate of the bus stand addressed by the leaders of CITU and All India Central Council of Trade Unions (AICCTU). Muktsar: Striking employees blocked the Muktsar-Malout highway at Muktsar bypass for hours. The bus stand wore a deserted look and buses were not allowed to enter. Public banks also remained largely shut. The number of inmates undergoing treatment at the centre has registered a decline ever since the byelection is announced. Malkiat Singh, director of the centre, said many addicts got themselves discharged due to the election. They would have to be given the treatment afresh, he said. He said at least 20 addicts were undergoing treatment before the announcement of the election, but now only five were left. "The centre is facing acute shortage of funds. It has nine staff members. They recently got their salary after 10 months. We do not have sufficient funds for medicines. The psychologist is paid Rs 6,500 per month and the doctor gets a paltry Rs 5,000 per month". The centre buys medicines on credit and pays the pending bills when it gets funds come from the Ministry of Social Justice and Empowerment. A doctor from the Civil Hospital visits the centre once a week to examine the patients. For the rest of the days, a male nurse and ward boy take care of the patients. Malkiat Singh said the ministry provided 90 per cent grants for the centre while the remaining was contributed by the Red Cross. The centre does not have money to pay its electricity bill of Rs 8,000 which is pending for the past two months. Malkiat Singh said prior to 2007, most addicts used to consume opium. But the scenario had changed with youths taking to synthetic drugs, hashish and smack, he said. On the first day, Ashutosh Chadha, Director, Corporate Affairs South Asia, Intel Technology India Private Limited, New Delhi, expressed deep concern over creating a generation of educated-unemployed and not employable educated. He had said we needed to understand that knowledge was a highway to success and had emerged as a new currency. The competition was now global and very stiff. He further said the quality of education was fundamental to reap the gains from the growth. The economies moved from agrarian to industrial to financial. Interactive skills were required in the modern era to sustain and build new production systems, he said. Professor Leonardo A Lanzona, Manila University, Philippines, argued that the source of growth changed over time with the development of technology. Inspector General, North West Frontier, Kripa Ram, while conveying his felicitations to all ITBP personnel, emphasised upon the need to be vigilant and prepared to meet any eventuality. 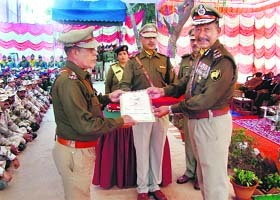 Highlighting the achievements of the force, Deputy Inspector General, Prem Singh said that climbing and skiing down Mt Everest, the world’s highest peak, a long range relay patrolling, river rafting expedition, marathon and a cycling expedition were among the events organised in addition to professional activities during the past year. Set up on February 20, 2007, the North-West Frontier is responsible for the operational and administrative control of three sector headquarters. It is also accountable for 11 units deployed in Jammu and Kashmir, Himachal Pradesh and Punjab that guard the border and deal with internal security. "I have been associated with the Akali Dal for the past 20 years. But I never expected that a person with a shady background will be inducted into the party. The move put an extra burden on the state exchequer by necessitating the byelection," he said. Kumar, ASI Kirpal Singh and Havildars Jaspal Singh, Wictor Masih and Ranjan Kumar. The order came during the hearing of a petition filed by Ram Sarup Sharma of Abohar seeking re-investigation of an FIR lodged by him. The FIR was registered on October 6, 2011, following the orders of Justice Ajay Lamba on the basis of investigation by the Superintendent of Police (SP-Detective), Bathinda. In his report, the SP had stated that the police officials, then posted with the Bathinda CIA staff, had raided the petitioner’s house, during the pendency of his petition for protection against harassment by the Bathinda police. They were allegedly raiding his house at Abohar, even though there was neither a written complaint, nor an FIR against him. The police officials denied the allegations by filing an affidavit in the High Court. It again allegedly raided his house during the pendency of his petition. The petitioner managed to record a video of the raid. The SP (Detective), Bathinda, then conducted an inquiry and found the police officials guilty. On his recommendations, an FIR was registered against the policed officials under Sections 182, 384, 511, 451, 506 and 120-B of the IPC. Justice Lamba, thereupon, disposed of the petition, giving liberty to the petitioner to approach the High Court again if he was not satisfied with police investigation. Subsequently, another SIT was set up by the Bathinda SSP, which recommended deletion of the non-bailable offence of extortion under Sections 384 and 511. The petitioner again approached the High Court for re-investigation by the CBI. Justice LN Mittal, dismissing the petition for a re-investigation, gave liberty to the petitioner to move the Trial Court. The Judge also directed the Punjab Government to transfer the five police officials involved in the criminal proceedings from Bathinda. It was further directed that the police officials would not be posted back at Bathinda until the conclusion of the criminal case. The reminder by Justice Rajiv Narain Raina came on a petition by Dr Mukul Singal after he failed to get his date of birth corrected from the Delhi High Court. The judgment by the Single Judge of the Delhi High Court was delivered in March 2011, before the appeal was turned down by a Division Bench. The Supreme Court too dismissed his plea in September 2012, and the matter attained finality. 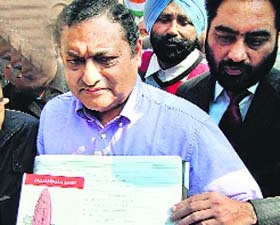 But Dr Singal filed another petition before the Court here for a direction to the Chandigarh Administration and another respondent to forward “educational commission for foreign medical graduates verification form” received from an institution in the USA for pursuing further studies abroad. The petitioner pleaded that his actual date of birth as per all his official records was July 12, 1988. But, it was erroneously recorded by the school authorities as July 12, 1989. The erroneous date of birth was then entered in his academic records. It was added that the petitioner had already lost a round of litigation and the date of birth recorded in his academic records, even though erroneously, had to be treated as final. It was further added for higher studies and for entry into USA, the authorities insists upon submission of supporting documents such as passport and birth certificate, which in his case “contain actual date of birth, which is not in tune with the academic record of the petitioner”. Justice Raina asserted: “It is unfortunate that the petitioner having lost till the Supreme Court in his effort to get his date of birth corrected yet insists that the date of birth recorded in the academic record is incorrect but has to be treated as final due to Court orders. What the petitioner could not get directly from the Delhi High Court, he seeks to get indirectly from this Court. It is not for this Court in writ jurisdiction to set about to remove the dichotomy between two sets of records or to command the respondents to do so…. “This petition is wholly misconceived, misdirected and manifestly devoid of any merit. I am sorry to say, the Bar owes a duty to the Court to carefully screen matters in chambers before filing such litigation and to exercise due care and restraint in pleadings as they hold the exalted status of Officers of the Court. I reluctantly hesitate to impose costs”. There is a large following of the dera in the districts along the Punjab-Haryana border and many are expected to enter Punjab for the hearing. Intelligence inputs suggest that there could be a large gathering in Bathinda outside the court complex where the dera chief is expected to appear. “We have alerted the respective district police chiefs to ensure that the crowds remain peaceful,” Punjab Additional Director General of Police-Intelligence, HS Dhillon told The Tribune. The case against the dera chief pertains to hurting Sikh sentiments in 2007 when he allegedly wore attire similar to that of Guru Gobind Singh. There have been several clashes between various Sikh factions and the dera followers in the past so the police does not want to take any chances. “Whenever there is any religious gathering of the dera, we ensure that several nakas are laid on the highway to keep a strict vigil on the crowds. We will monitor the state highway from Haryana to Sangrur police limits,” said HS Bhullar, Senior Superintendent of Police (SSP) Sangrur. “Police nakas will be in place till February 22,” Bhullar said. In addition to Sangrur-Patiala, Bathinda, Barnala, Mansa and a couple of other districts have also been put on alert. Another senior official confirmed that forces other districts have been summoned to reach Bathinda to put in place proper security arrangements in and around the venue of the dera chief’s stay in Bathinda. Moreover, the Moga by-election is also set to be held on February 23. Senior leaders of the Congress and the Shiromani Akali Dal have been camping at Moga for the past over a week. “One minor incident can totally change the outcome of the elections, therefore security needs to be tight,” said a police officer. Deputy Commissioner of Police (DCP) Sarabjit Singh said Gurmeet Singh, resident of Urban Estate Phase-I, his brother-in-law Ranjit Singh, a dismissed Assistant Sub-Inspector, and Nishan Singh of Garha area had been arrested for kidnapping and killing Garg. Son of a police inspector, who died fighting terrorists in Amritsar, Ranjit Singh was inducted into the Punjab Police but was dismissed for "unsatisfactory service record". He was residing at the Jalandnar Police Lines with his mother. The DCP said Gurmeet Singh and Ranjit Singh hatched a conspiracy to rob Garg of his money. Gurmeet Singh called up Garg on the pretext of exchanging dollars worth Rs 8 lakh. He picked up Garg from the Capital Local Area Bank and drove towards Nakodar in a Skoda car. They were joined by Ranjit Singh and Nishan Singh near the Urban Estate. The latter strangled Garg with a rope. Taking him to be dead, they dragged him into a farm-shed where they found him gasping for life. They then shot Garg with a revolver in the temple. To destroy evidence, the killers dug up a trench inside the shed and buried the body after sprinkling salt on it. The body was exhumed in the presence of area tehsildar Gurmit Singh this evening. A case has been registered. As evidence, the teachers of the Guru Tegh Bahadur Khalsa College for Women, Dasuya, submitted a CD with the voice recording of the accused. The voice samples of the accused will also be recorded by the probing panel and will be sent to the laboratory. Sources at PU said the four-member fact finding committee, constituted by the university, had received a CD from the complainants. The centre superintendent and the members of the management whose voice samples are recorded in the CD have been asked to appear before the probing committee to record their voice samples. These would also be sent to CFSL for voice matching. The teachers had complained to the PU on December 24, last year, alleging sexual harassment by the accused. The university formed a panel to probe into the complaint on January 20. Ropar Senior Superintendent of Police Inder Mohan Singh Bhatti said Satwinder along with his wife had gone to meet his in-laws in Rajpura on February 14. On February 17, he left Rajpura to meet one of his friends at Chandigarh but never returned. The police has started the investigation and has registered a case under Section 363 of the IPC, added Bhatti.